Chile (spicy) is deliciously hot spicy vegan recipe that is great for lunch or dinner. This recipe will serve 6-8 adults as a main meal. It takes about 20 minutes to prepare, and since we are cooking the chili in our slow cooker part of the prepatation time is in the evening the day before we desire to serve it, and the balance of the preparation time is in the morning of the day we are serving it. 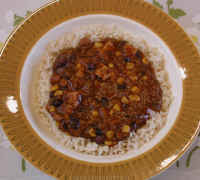 We prepare our chili in a slow-cooker (crock-pot), but it can also be prepared on the stove top in a large covered pot. If using a slow cooker, we suggest that you begin cooking the beans the night before. If cooking the beans on the stove top, we suggest soaking the beans the night before and then begin cooking first thing in the morning. 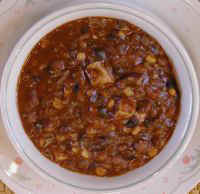 This chili recipe can be made with one kind of beans or several varieties (black, kidney, pinto, or multi-bean blends). Wash and clean the beans and place in a slow cooker. Add 10 cups of boiling water. (This speeds up the cooking process.) Cook on "high" until you're ready for bed, and then turn down the heat to "low" for cooking overnight. First thing in the morning, turn the slow-cooker heat up to "high." Prepare all the other ingredients and preheat them before adding to the slow-cooker. Cook on "high" for another 4 to 6 hours. Add water as necessary. If cooking on the stove top, first thing in the morning begin cooking the beans. When the water begins to boil, lower the heat to simmer. 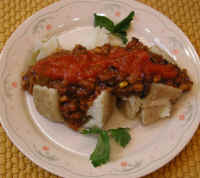 When the beans have softened, prepare all the other ingredients and add to the cooking pot. Raise the heat until the ingredients begin to boil and then lower the heat to simmer. Cook for another 4 to 6 hours. Stir often during the cooking process. 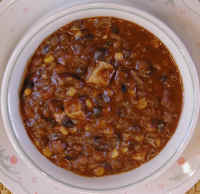 If the chili begins to thicken before it is thoroughly cooked, add a little water. Serve the chili either as is, or over brown rice or baked potatoes. 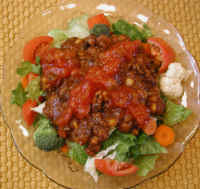 You also can use the leftovers to make a chili salad. Enjoy!